maysay.in, mere ghar me to roj coalition khana hi banta hai? lagta hai gharwale Indian politicians se kuch seekh rahe hai! Indian Govt. ki to trademark hai coalition….Cheers to u for such a humorous doodle…. Thank you for the reader friendly font! Appreciate it. 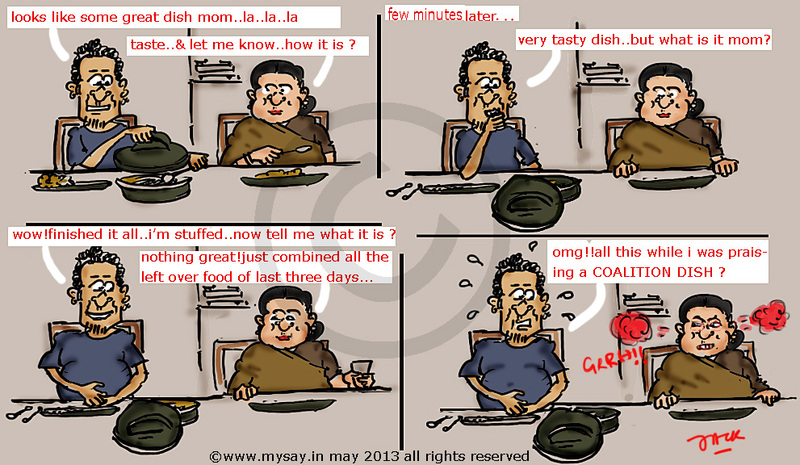 Haha… political thoughts creeping into family matters too, that too in food. Btw, the mom seriously looks like a political figure. That was very nice but also true, also avoids wastage of food when there is so much poverty n hunger around. Kahani har ghar ki … Kahani ghar ghar ki … Food Coalition and mom have a good bonding .. they definitely know mow to remix and deceive us ! haha too good Mysay ! Your doodles bring a smile on my face ! 🙂 That was funny! Loved this one! hahahhaahaha 😀 poor hubby !! Aha the mom had all the fun just like she is having at the Centre :). hahaha.. thats the nice way to promote ideas !! Ha ha ha. Mom is a nice environmentalist; she knows how to recycle things. You were duped, you were duped! coalition foods are very tasty…more tasty than the original ones at times 🙂 Mums are really a magicians who are able to deliver such awesome coalition dishes every single time 🙂 good on Jack!